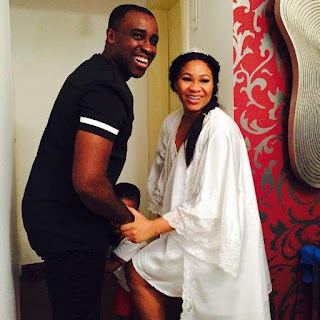 TV host, Frank Edoho and wife, Sandra have welcomed their second patter of feet! The duo ushered in a baby boy in a hospital in the U.S. Details of the birth however hasn't been disclosed yet. The couple welcomed their first child in 2014. Frank is blessed with 3 children from his previous marriage to Katherine Obiang while Sandra has a child from a previous relationship. Meanwhile, the happy media personality threw a surprise pyjamas themed baby shower for his wife aided by her friends, Mabel Makun, Timaya's baby mama, Barbara and others. After the crash of his first marriage to Katherine Edoho and mother of his three kids, Frank and Sandra Onyenucheya got married in 2014 after being together for over two years.